Rotary club of Grantham England has been conducting Swimarathon’s to raise funds for local charities. During London Olympics they decided to create a worldwide event to create Awareness About Polio. This event was created on Social Media without spending any money on advertisement. This year also Rotary Club of Belgaum South is again being part of the Rotary Global Swimarathon being held on 23rd Feb 2014. This year Rotary Belgaum South is conducting Swimarathon to create awareness about Polio even though India has been declared polio free the danger is still present as neighboring Pakistan and Afghanistan still have this crippling disease. The first event was held Globally on 25th Feb and 112 twelve clubs in 23 countries and 5 continents . Paralympic and Olympic Stars along with ordinary people participated in the event lined up simultaneously at exactly the same hour whatever maybe the local time. This was a Guinness World Record as the biggest Global Charity Swimming event in the world and US $ 104,000.00 were raised for End Polio Campaign. The second event was held on 23 February 2013 as a 24 hour worldwide event celebrating the 108th birthday of Rotary International and around 250 clubs in 39 countries participated and US $ 225,000.00 were raised. 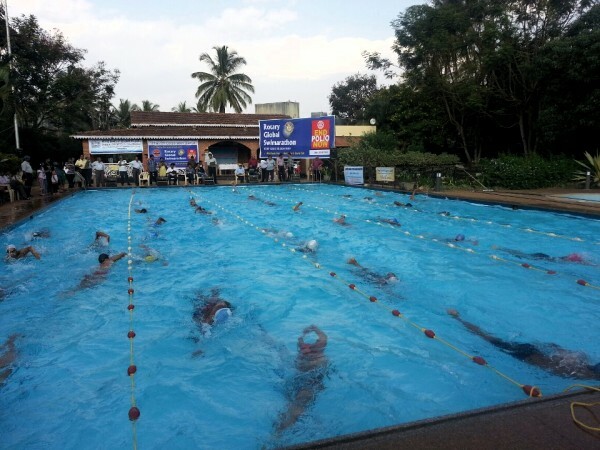 Rotary Club of Belgaum South participated in the second Global Swimarathon and 185 swimmers participated . The target was 108 KMS relay swimming to commemorate 108 years of Rotary but the final figure achieved was 146 KMS. This year they are also holding this Swimarathon as a memorial to Dr Jonas Salk who was the chief architect of Polio Vaccine. He chose not to patent his Polio Vaccine in 1955 to make it affordable to millions of people who needed it . If he had patented this vaccine he would have earned more than $ 7 billion by the time he passed away in the year 1995. This year is his birth the centennial year, and India has been declared Polio, we are holding this year’s Swimarathon as a memorial to this great man. The President Secretary and members of Rotary Club of Belgaum South request swimmers to participate in this event and make it a grand success. The Event shall be held at 3.00 pm onwards at Hind Social Club Swimming Pool Hindwadi, on 23 Feb 2013.